Multi-talented musician Sam Ock’s sophomore album GREY has achieved unparalleled worldwide success less than two months after its release on January 2, 2015. Ock has quickly become the first Korean Christian artist to both top Japanese charts and perform on major Korean broadcasts – and yet operate primarily in the United States. Within one week of GREY’s release, Ock saw extensive recognition in Korea, beginning with a Featured Artist headliner on major Korean online retailer Melon. The musician then made guest appearances on large-scale television broadcasts in Korea, including 1theK (Kpop Worldwide), Sketch Book, SBS Radio, and KBS Radio – performing to hundreds of thousands of international viewers while selling out his first solo concert in Seoul, Korea. Sam Ock’s music can be described as having bright and jazzy instrumentation laced with soulful singing and smooth rap vocals. This attractive sound has brought him global attention even prior to GREY’s release; in October 2014, Ock was recognized as the Hidden Artist of the Month on Bugs Korea, another leading online retailer overseas. Almost simultaneously, his release of Stages last year peaked in Japan at #1 on the iTunes Store’s Hip Hop Albums chart, leading to a sold-out tour through six Japanese cities. Additionally, the musician’s rare blending of styles has drawn great demand universally, prompting Ock’s tours through Korea and Japan over the past year, along with increasing requests for visits from fans in the Philippines, Indonesia, Malaysia, and Singapore. 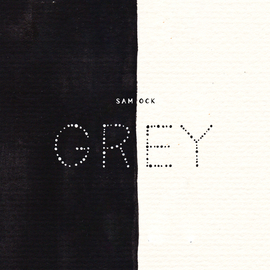 With such an unusual American artist seeing such international success, GREY has unexpectedly become the record to buy, while Sam Ock has truly become the artist to watch.